If you’ve ever watched any submarine movie – say Crimson Tide, The Hunt for Red October – there’s one sound you’ll ALWAYS hear. That hollow, shimmering ‘PING!.. PING!..’ sound. Of course, that is the sound of the active sonar that the submarine uses to navigate the deepest, darkest oceans. Each ping radiates out through the water, bouncing off obstacles and sketching out an updated view of the world surrounding the vehicle. The submarine uses a system of constant testing – if those pings stop, the submarine is effectively blind. UX testing is not so different. How can a business know if a change to a website or software’s user experience (UX) is having any effect? How can they know if a particular webpage is producing more customer complaints than it used to? How can a business measure the success of any UX design elements? They must be measured frequently. A business that is not conducting frequent benchmarking of its UX elements is like a submarine working off a single ‘ping’. They may know some of what is going on around them, but the details will fade quickly and they will have huge trouble dealing with changes. UX design covers such a wide array of software and website elements that measuring it as a whole can be complicated, but breaking it down into individual elements and measuring those can provide a wealth of valuable information. Businesses also need to set their UX benchmarks to be able to gauge the success or failure of changes to UX elements. Without a benchmark to measure statistics against, they are relatively worthless. Old benchmarks can be useful information to keep around, but you must update current benchmarks of performance frequently to stay useful. While UX design is still a relatively new concept in the quickly evolving digital world, companies have discovered metrics by which to measure the performance of many of its aspects. Some of these derive from similar aspects of customer experience research and mapping for physical business facets – others are wholly unique to UX. The change in the number of user errors or customer complaints. Increases or decreases in the element’s ease of use. Changes in the difficulty of learning to use the design aspect. Noting changes in the amount of traffic, the number of interactions, and the audience size. Being aware of increases or decreases in visits from repeat customers (customer retention). Marking changes in the amount of visits from new customers (customer attraction). Noting the amount of new traffic coming into a website from search engines. Use Google Plot Rows to measure UX performance over time. 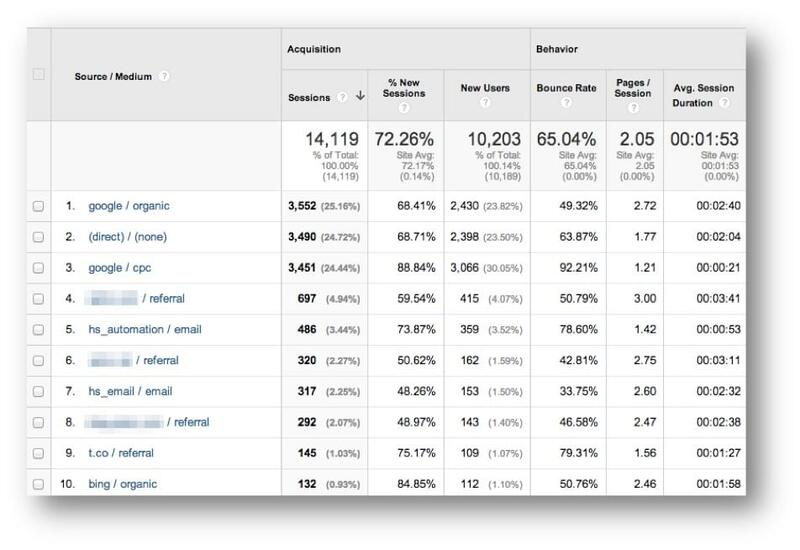 Below is an example of how Google Analytics measures user interactions across various metrics. Finally, the goal of increased sales can be monitored by measuring changes in the numbers of transactions, purchases, or product sales. You should strive to maintain constant oversight over these key metrics. The same reasons that UX measurement methods vary so widely necessitate a wide variety of collection methods for user experience data. Different information will come from different sources – statistics on traffic, visits, sales, and other such numerical data can be collected easily enough from simple monitoring tools. However, UX doesn’t just concern itself with statistics. UX research and design is customer-focused and collecting data on customers can be done by different methods. Observe user interaction with your website or software. What tasks are they trying to accomplish, and how are they going about doing them? User experience designers can use information gained this way to learn about customer preferences, how tasks are being completed, and other such real-world considerations. Contextual interviews provide companies with feedback on what users think of their services. A script-based method of information collection, focus groups may not catch as many minor measurements as contextual interviews, but they can quickly gather information that companies consider valuable. Focus groups can also be good for initial assessments and answering specific questions. This form of information gathering provides an essential first benchmark for a UX element’s initial performance. Prototyping is not done on its own, but in conjunction with other types of information gathering, in fact, prototyping isn’t so much a method of information gathering as it is a time to gather information before choosing to go ahead with a project. This type of information gathering is used to decide between two or more options. It is the side-by-side or back-to-back comparison between the performance of variations in a website, service, UX element, or software. The table below is an example of how to track where your users are coming from, how they’re finding you, and which marketing methods are working. These methods of UX information gathering are best done with real users, but most can also be done with hypothetical target customers. Why is it so important to benchmark UX performance and perform frequent measurements? Because it allows businesses to monitor their customer bases, and it allows improvements to be made to their customer’s interactions with their websites or software. That is just the obvious benefit of measuring UX, however. There are some benefits that come from measuring UX that businesses may not recognize. The first benefit is tracking specific goals within your wider user experience. Knowing that you made a profit and had lots of traffic at the end of the year is nice, but not very useful. Measuring the performance of specific user experience elements allows the creation of more informative reports and the setting of more specific improvement goals. Knowing how UX changes added to an increase in traffic or sales is better than simply being aware that it happened. Closely tied to the benefit of knowing more about the performance of specific UX elements is the benefit of being able to better motivate the user experience design teams. Again, knowing just that overall performance was good isn’t very helpful. To motivate UX designers, managers need to be able to point out specific areas that did very well and give praise where it is due or to inform designers that this area or that one needs more work. Employees thrive on feedback, and measuring UX elements allows for feedback for the employees who work on them. Spending a lot of time measuring UX can help businesses adopt a more user-centered culture. Some businesses are very good at looking at things from their customers’ perspective and making business decisions accordingly. Other companies are more focused on other things, and their customers suffer for it. Finally, benchmarking user experience allows businesses to make better design decisions. A website or software’s design should focus on how customers interact with it, and any changes to the design need to be measured against how it affects customers. Without a benchmark of previous customer interaction information, the results of design changes are difficult to assess. Also, knowing what has worked to improve user experience measurably in one area can be useful in driving design changes in others. Benchmarking and measuring performance in UX design are just as necessary as doing so in other elements of a business and more necessary than some of them. Without benchmarks and ongoing measurements, businesses are largely blind to their successes and failures. UX measurements can also have some surprising benefits that can drive design decisions and affect businesses as a whole.